Shop Till You Drop! There is so much to explore in the bustling bazaars(market) of Rajasthan that you have to dedicate several days to it. The bustling bazaars of the state are full of different varieties of arts and crafts that you would love to see and buy. Each region of the state has its own special form of art and craft. They have something or the other to cater to the taste of every kind of traveler. The bazaars look extremely colorful. Be it fine wooden furniture, exquisitely carved marble statues, leather ware, metal items or the famous tie and dye and block printed fabrics,miniature paintings, saris and jewelery, the bazaars of Rajasthan are spilled with them. JAIPUR: The pink city is dotted with countless shops each having its own specialty. There are several shops which are entirely dedicated to only one shopping item such as juttees, braids for the hair, buttons, laces etc. The old city is lined with countless shops selling dazzling semi-precious stones, silver jewelery, durable dhurries and lame ribbons. Head to Muslim area of Pharganj for semi precious stones. Bapu bazar and Johri bazaar are famous for saris and fabrics, Kisanpol bazaar for tie and dye textiles, Nehru bazaar for fabrics, perfume and juttees, Khazane walon ka rasta for marble statues and Badi Chaupar for block printed textiles and quilts. Visit the Rajasthan Handicraft Emporium for everything Rajasthan can offer. 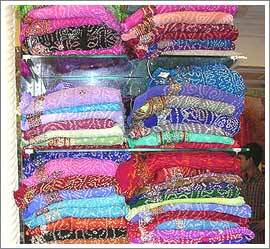 BARMER: Straight away head for Sadar Bazar for colorful embroideries, woolen dhurries and stone carvings. BIKANER: Indulge in shopping at shops around Kot Gate for leather products especially footwear,woolen carpets and blankets, light cotton quilts, cotton fabrics of bright colors. JODHPUR: The old city in Jodhpur is the perfect place to buy tie and dye fabrics with silver and golden embroidery, badalas or zinc alloy pictures,wooden toys, leather items, paintings,juttees and silver jewelry. Visit the base of the Chhattar Hill for fabulous furniture and artifacts. JAISALMER: The streets of Jaisalmer are lined with numerous shops displaying and selling wooden boxes in beautiful designs, woolen and cotton rugs and blankets, embroidered fabrics, silver jewelry and trinkets. KOTA: If you are fond of sober saris then you must check out the bazaars of Kota specializing in cotton saris in beautiful floral prints. PUSHKAR: Here you can buy many things such as camel saddles, jewelery, colorful embroidered fabrics, shawls, bangles, beads, blankets, terracotta pots. UDAIPUR: The shops of this romantic city are stocked with wonderful miniature paintings,terracotta tables and plaques, tie and dye fabrics, wooden toys, white metal objects, silver enamel artifacts and mesmerizing images of Krishna made in Nathdwara style.